*I didn’t have any chocolate ice cream on hand, so I used vanilla bean ice cream & added about 4 tablespoons of chocolate syrup to the mix! You can also use coffee ice cream & chocolate syrup. Place the ice cream and milk into a blender and blend until smooth. Pour some or all into glasses for any kiddies or preggers ladies. For the adults only version, add the espresso powder, Kahula, and Irish Cream and blend until smooth. Pour into glasses and garnish as desired. Hoolllyyyyy crraaapppp that looks incredible! I am definitely bookmarking and trying this. Thanks for sharing! sooooooooooooo decadent! Sign me up! And now I have to buy Kahlua. Oh wow, this is awesome during a blizzard!! Well, actually it would be awesome just about anytime!! Thank you so, so much for stepping up and covering for us! I so appreciate it!! 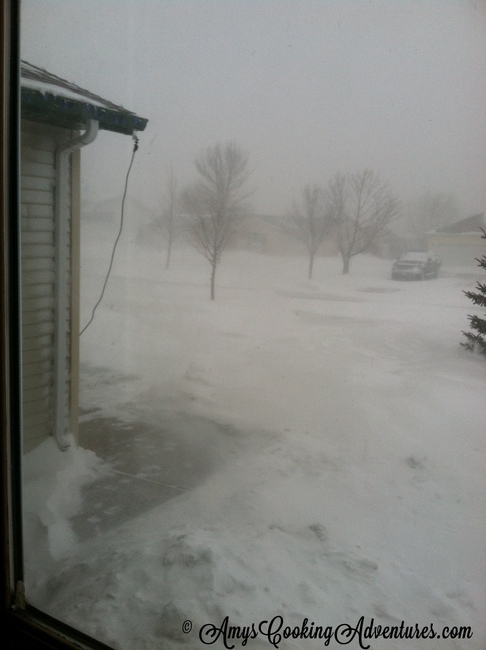 Wow, that is a blizzard!!! I would take a boozy ice cream drink any day, looks delicious! Thank you for adopting an orphan today, you're a dear! The Mudslide does sound like a fabulous way to wait out a blizzard, though! Yum. I also love your photo-so professional. Thanks so much for having adopted my blog...I do appreciate it!!! You did such a great job. Your photo is gorgeous and makes me drink mudslides again. As you said, "Someone else’s loss is my gain!" Oh, yes!! You made my day, girl!!! I haven't had a mudslide for soooo long. Love them! Ugh. Know how you feel - we got nearly 3 feet last weekend. But booze and ice cream make everything better! Great choice! Looks delicious! Great SRC choice! WOW - hope the weather is getting better. I'll take an extra large adult version, please. Looks like a delicious recipe! Thank you for sharing with Foodie Friends Friday! Please come back this week with another great recipe! Hope you're all "shoveled" out from the snow!